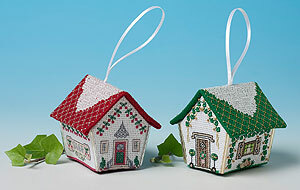 Another pack of two Gingerbread Houses - Christmas Rose has a green roof with Christmas roses worked around the walls. Cherry Tree has a red roof with a pretty pattern of cherries worked as a frieze and a cherry tree in full blossom on the back wall. Both designs sparkle with beads and metallic thread. Kit contains 18 & 14-count aida, felt, stranded thread, pre cut plastic canvas pieces, beads, ribbon, needles, charts and full instructions.